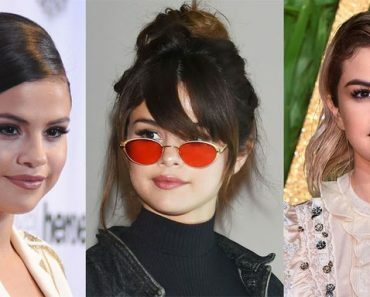 With the current love for healthy natural living and obsession with 70s fashion, boho hairstyles are not just on the rise—they’ve completely evolved. Ready to be shocked by some mad creativity and skill? Get ready for disheveled braids, buns and twists in creative bohemian hair styles. 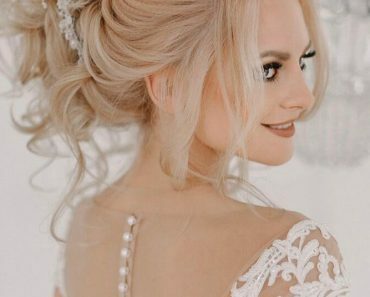 Today’s trendy boho updos, downdos and half up styles feature pastel highlights, an abundance of accessories or parts of plants used as accessories and a variety of braided elements. Draw inspiration from nature and 70’s hairstyles, experiment with the do’s listed below and invent your own exclusive styles! 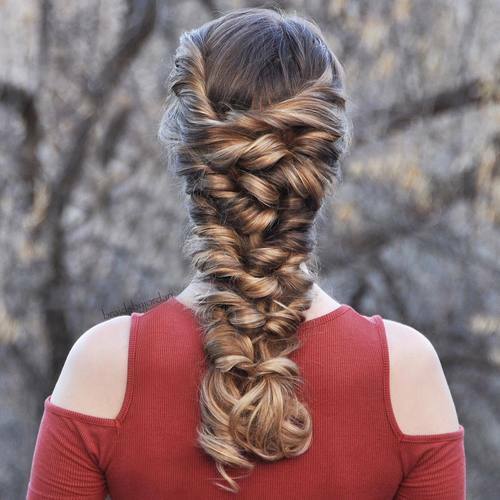 This intricate style starts off with a waterfall braid. Next bohemian florettes (braids that are pulled loose and swirled into a circle) are added. These are made from the sections you take from under the waterfall braid. The latter incorporates strands from the hairline for a flowy, elegant look. Boho hairstyles can be interpreted in about five thousand ways—Old Hollywood Glam being one of them. Soft hair with full volume is what being a bombshell is all about. First use a salt spray or a spray made just for braiding. 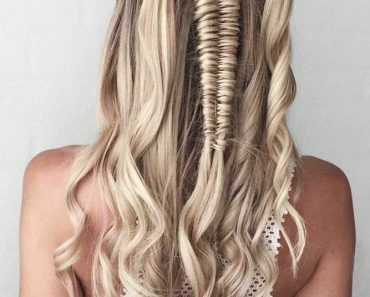 Then tease hair and create a loose fish tail. Pull at it for the maximum volume and pin the end under. 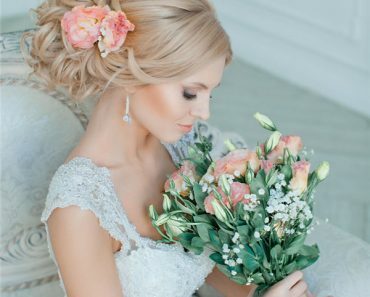 Half updo is one of the most romantic types of boho hairstyles. Additional tenderness and lightness it gets thanks to the crimped texture and a cute headband, made from real flowers. What an inspiring combination! For a look that’s not overly bohemian, section off the top part of hair with two side parts and clip it up. Then make a low ponytail as slick and perfect as you can get it. Tease the upper section, create a chunky fish tail braid towards the nape of the neck, wrap a piece from the pony around it at the nape and fishtail the upper part of the low ponytail. 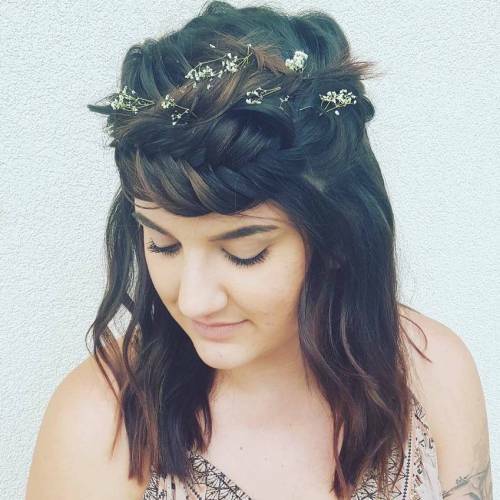 This fishtail headband braid makes the boho hairstyle unique. 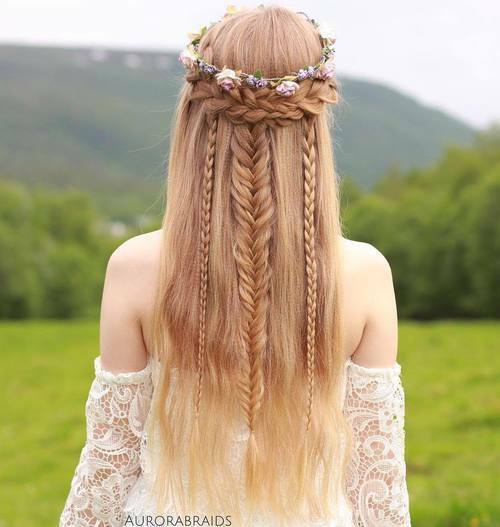 Typically, flower accessories added to braids are colorful, but the white ones look fresh and unexpected, don`t they? 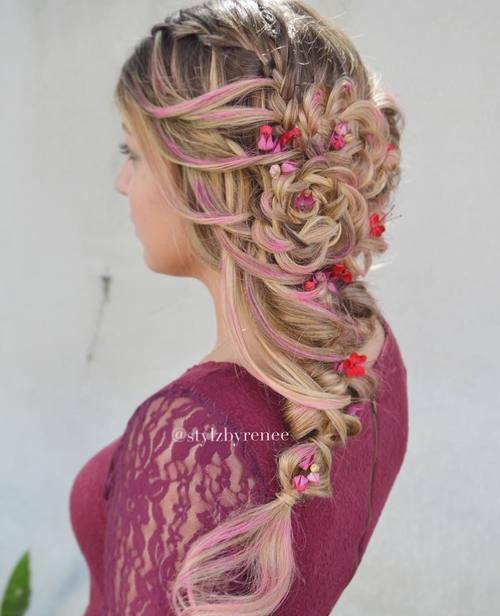 This princess hairstyle is gorgeous and creative. Layer the braids playing with varied tightness of your fishtail plaits. The trick is to divide and conquer! Add a Princess headband for added flair. For an easy take on the trend, create a messy low twisted updo and add boho style accessories. The colorful hair looks harmonious with this imperfect, wearable look. A salt spray (used before you begin) helps hold the haphazard twists and braids in place. Boho hair can walk the line between messy and perfect. 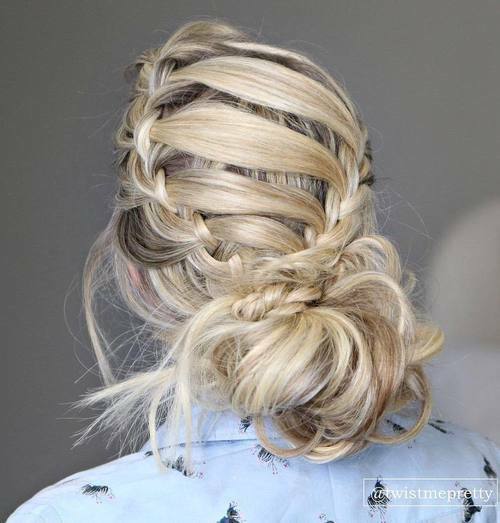 We love interesting combinations of braids and buns, and this combo is definitely at the top of our try-it-soon list. 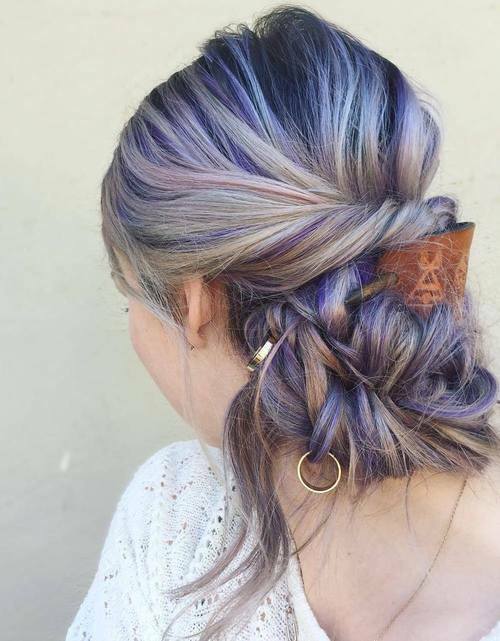 The juxtaposition between the loose and tight braids looks super cool and shows off the dimensional color. 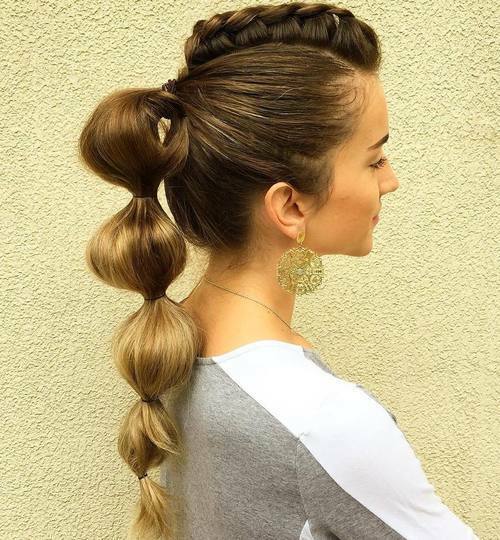 This chic hairstyle is so versatile. The fishtail headband and loops sliding from the crown towards the nape make it elegant, but the face-framing wisps of hair aren’t too formal. Pair it with a 70s style dress and you’re guaranteed to turn heads that day. Natural colors and textures are oh so boho. Think beyond your typical hair accessories! We all love chain and flowers and snippets of tiny leaves but…what about yarn? Yes yarn. You get to add crazy color to your hair without the commitment. Perfect for a music festival or concert, this braided, wrapped bohemian style is a stand out. 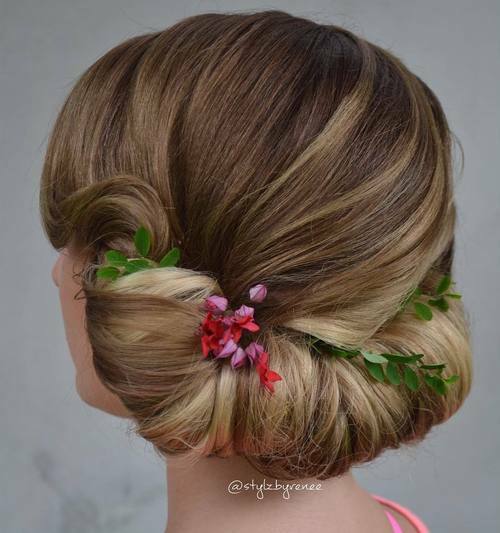 Boho hair can veer as formal as you like. For medium hair, this is a great choice—because you’ve got just enough but not too much of length to work with. The wrap can be styled with a headband or like a topsy ponytail that you do not wrap through but hide inside the wrap. This boho style is kind of incredible. Best for long hair, this braid is created with a series of loops that shape a chunky intricately plaited braid. The loose curls at the end blend well with the twists and twirls above, so if you’ve got straight hair, be sure to add curls first. 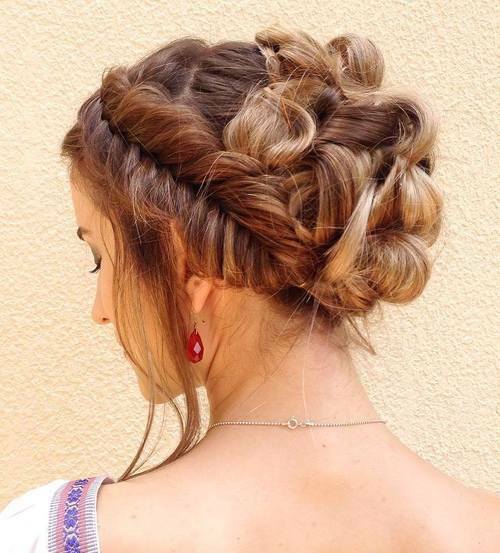 Cute braided updos should be your new favorite thing. 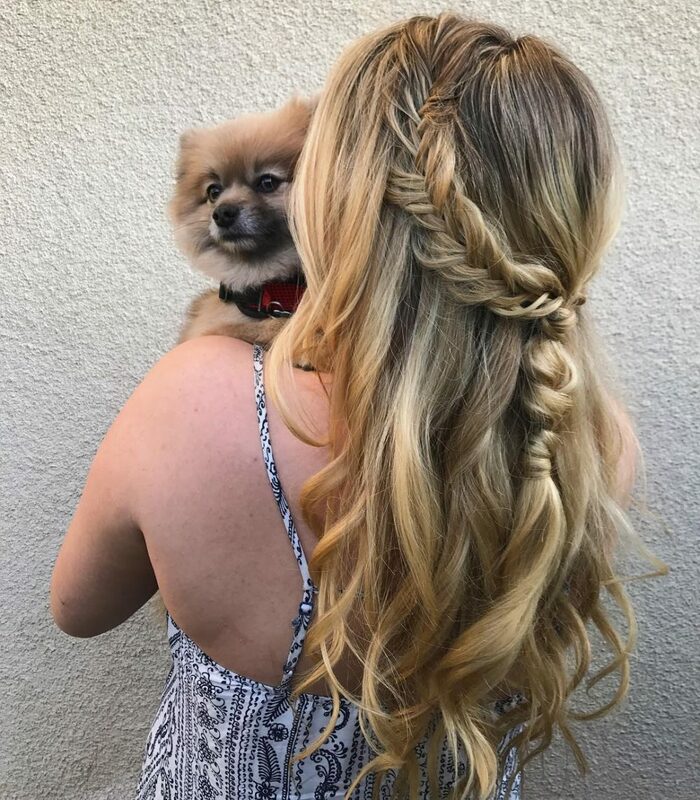 To try this bohemian hair style, create a waterfall braid on one side of the head that drops the strands across your head instead down, along the length. 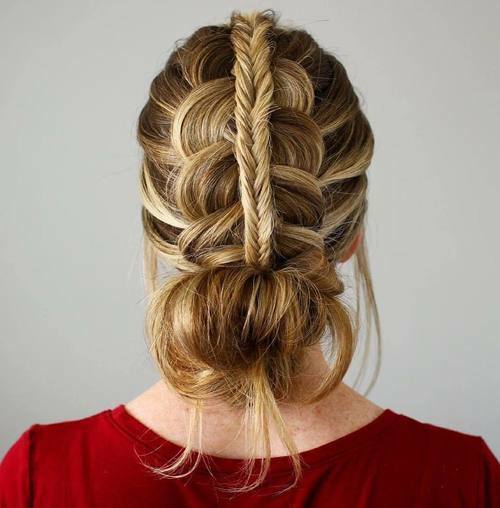 Then incorporate those strands with the braid on the other side of your head. 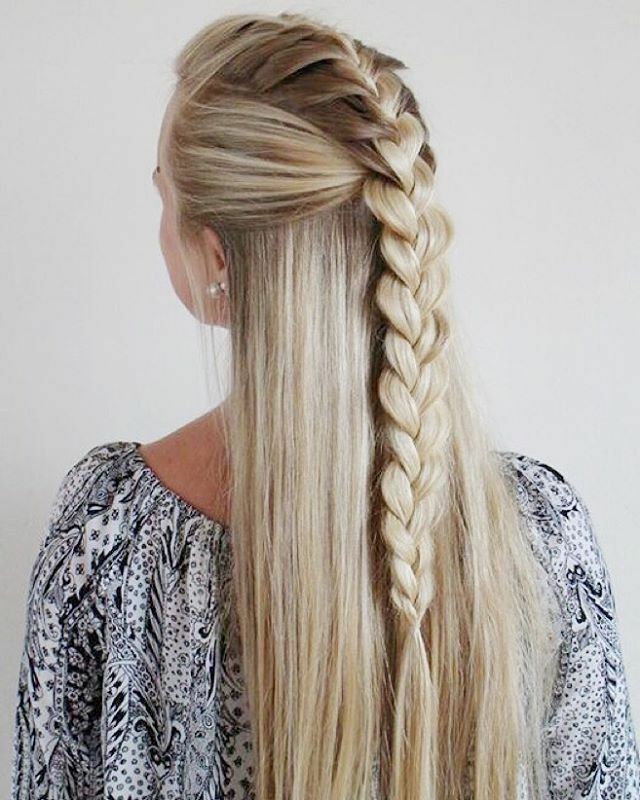 Lowlights and dark roots help the blond braids stand out. Boho hairstyles like this one channel the 70s in the best possible way. For a look that makes no mistake about you being the drummer’s girlfriend, let rainbow highlights act as hair accessories. The key is to try different styles of braids: crown, wrapped, banded. 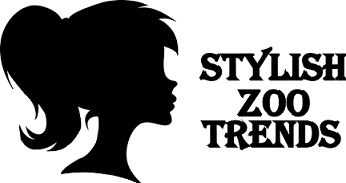 This super cool style is great for long hair. Keep it sleek by making perfect parts for the upper section and slicking the rest back. Tease the top, which you can make stand up with the right amount of tension. Add bubbles to tie everything together. If you have short hair, not every boho style is off limits. 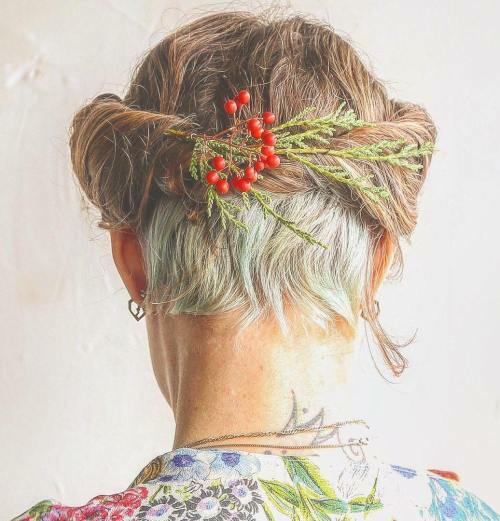 Create a foundation for a cute rowanberry twig by twisting hair from the front to the back. Thanks to the funky nape undercut, you get a perfect vintage meets modern style. An on-trend boho braid needs to have natural-looking texture. So don`t make your hairstyle too neat, leave it slightly messy. Part your hair down the middle (as if for pigtails) and save out loose strands in the front. Then braid, wrap around, and pin in place. Part feminine and part edgy, this braided mohawk with side cornrows looks extra special because of the peachy ombre. 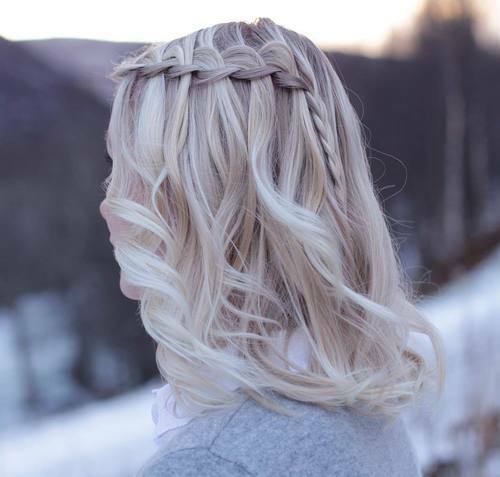 The brighter color will stand out against the dark blonde (or brown) base no matter how you style it, and a messyDutch braid is definitely one to throw into the mix of options. Accessories are a big part of any chic boho style. So let’s talk chains. Always plan your hairstyle around the chain you’ll be wearing. If it’s supposed to lay straight down the middle of your hair, than be sure to make a perfect middle part. Don’t get us wrong. 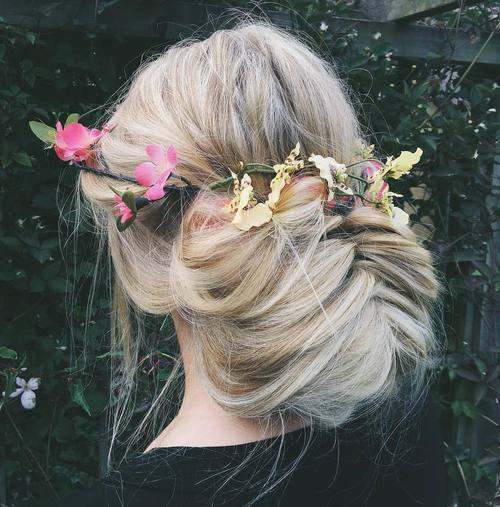 Boho hair doesn’t have to be complicated—it can actually be really easy! The style is more about the laidback, creative vibe than how many hours it took to complete. A side waterfall braid is a great way to achieve the look (and keep your hair out of your face). Whatever you’re up to (from going on a date to just being bored at home), boho hairstyles will bring out your creativity and make you feel instantly prettier. Design your own never-before-seen bohemian style or play copycat with one of these.